​affect 80% of people aged 60 and above in Singapore and is the most common cause of blindness in the world. As cataracts cause neither pain nor irritation, what can you do to prevent it and spot it in your loved ones?​ ​​What are the symptoms to look out for and does your risk of developing cataracts increase with age or diabetes? 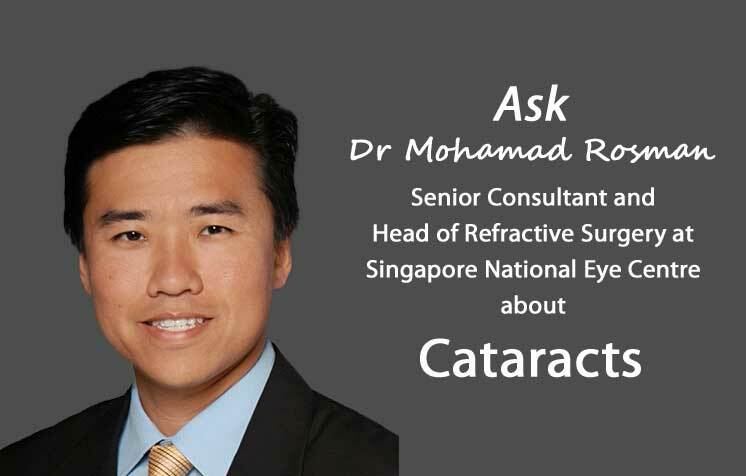 In conjunction with Cataract Awareness Month in June 2017, we invite you​ to ask Dr Mohamad Rosman Bin Othman​, Senior Consultant at the General Cataract and Comprehensive Ophthalmology Department​, Sing​​apore National Eye Centre, a member of the SingHealth​ group, ​questions relating to cataracts. Dr Rosman is a senior consultant ophthalmologist in the Refractive Surgery Department and Cataract and Comprehensive Department, Singapore National Eye Centre.He is also an Assistant Professor from the Graduate School of Medicine, Duke-NUS. He is also the Head of the Refractive Surgery Department which subspecialises in the correction of myopia, astigmatism, hyperopia and presbyopia through various surgical procedures, including LASIK, SMILE and ICL surgeries. Dr Rosman completed his medical training in 1997 at the National University of Singapore and was the Valedictorian for his graduating class. After obtainin​g his Fellowship of the Royal C​ollege of Surgeons (Edinburgh) and Fellowship of the Academy of Medicine in Ophthalmology in 2007, Asst Prof Rosman subsequently went on to complete 2 advanced Fellowship Programmes on Refractive Surgery at the Singapore National Eye Centre and at the VISSUM Eye Institute in Spain. Dr Rosman's research interests include refractive surgery, cataracts and the epidemiology of eye diseases among Singaporean Malays. He has published papers in international peer-reviewed journals on these topics and written several book chapters on Refractive Surgery. In addition, he has participated in numerous local and international conferences and was involved in organising and conducting instructional courses on Refractive Surgery both locally and overseas. Dr Rosman is also currently the head of the Optometry Department at SNEC and an adjunct Senior Clinician Investigator at the Singapore Eye Research Institute. He also holds the teaching posts of Core Faculty for SNEC Residency Program and is a Clinical Senior Lecturer for the YLL School of Medicine, National University of Singapore. Asst Prof Rosman is also fluent in several languages, including English, Chinese (Mandarin), Malay and Bahasa Indonesia. See ​next page for answered questions on cataracts by Dr Rosman. Childhood Myopia: Prevent It by Playing Outdoors!